Investing in a real estate property is a great way to secure a steady extra stream of income for yourself in the future. However, it’s also a path that has many forks, with many choices to make. One of the most fundamental decisions you have to face when investing in property is whether to choose a house or apartment. Below are a number of questions to ask yourself when considering this decision. Are exterior aesthetics important to you? As you can see on websites like www.coralhomes.com.au , houses have the ability to be delightful structures that look amazing. A house gives you a lot of variety to choose from in terms of exterior aesthetics, while apartments are very limited in this regard. If your dream investment property involves landscaping, gardens, or striking external features, a house is most likely more suitable to you than an apartment. Would historic trends influence your decision? Traditionally, houses are the more reliable and secure investment. More recently, apartments have begun to make up ground (figuratively), but houses are still widely considered the safer option in terms of property investment due to the physical land that comes with them. In renting apartments, some of the burden of things like maintenance and repairs will be taken over by a body corporate. Meanwhile, in a house, this responsibility will fall on you as the landlord. While some people like the shared responsibility that comes with an apartment investment property, others prefer being solely in charge of what happens with their property. Also, the responsibility of having to pay rent or a large mortgage might also be a factor when deciding between a rental or a permanent house. Where you sit on this issue will most likely come down to your personality type and perhaps past experiences with landlords or body corporates. What are the lifestyle trends in the area? It’s important to consider what kind of lifestyles are trending in the area where you’re thinking about buying an investment property. If apartment living is increasing in popularity, that might be the way to go. But if houses are still the dominant home structure, this could be your preferred route. Are you in this for the short term or long term? If your investment property is a long term financial strategy, the past points to houses as being the more stable and profitable option for investing. Meanwhile, recent evidence suggests that, in some cases, apartments can yield a stronger return in shorter or medium time frames. This is an important factor to consider when making your decision; typically, investing in property is something done with the long-term gains in mind, however, whether this is the case for you is determined by your goals and perceptions. There are several things to take into account when deciding between investing in an apartment or house. When it comes down to it, the choice depends upon your personal preferences and your view on all the questions above, as well as anything else you consider an important factor. There are both advantages and disadvantages to either option but, regardless of your final decision, you’ll most likely find that investing in property was a wise decision that results in financial rewards and emotional satisfaction in the future. House vs. 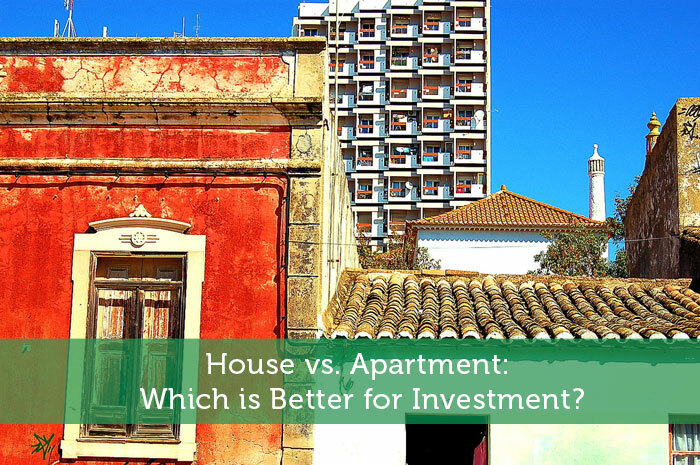 Apartment: Which is Better for Investment? Definitely go for a house with land if that’s an option for you. They can’t build more land, so any property with land will hold more value and increase in price faster as land becomes more scarce. We’ve considered the idea of buying a rental property, but I think we might be more the REIT kinda people. Our portfolio isn’t big enough to absorb the risks involved in running a rental property. Especially one that’s out of town, which it likely would be because our market is pretty pricey right now. I acquired several pieces of property from my mom and hated every minute of being a landlord. So I sold every one outright except for one which I am selling to the tenants contract for deed. If I were going to get back into rentals I’d probably go for the apartment building. That way, you have other apartments being rented to help offset the loss of income should a vacancy occur. I consider my rental property as an investment, though if I were living in the home, I would consider it more of a liability. Good article! House will be my answer. I want my family to have their own personal spaces each member (even pets), including backyards. House also covers long term and stability plans which is more practical for me. Thank you for this article. It is really helpful. I’m pretty new at home owning but it’s been pretty rewarding (and a big learning curve) so far. I live in LA where real estate is ridiculously high and I’m happy and lucky enough to own a home. Most people will never be able to afford a home in this city unfortunately. Nice article! Investing in a property is, indeed, a good idea. I think you should consider some factors before you make an investment decision. First, you need to choose the place or location for your property. Is the location accessible and convenient? How about the security and neighbourhood surrounding the area? The property’s quality is a very important factor to consider, too. Is the developer reputable (this is particularly applicable to condominiums)? And lastly, you need to make a thorough assessment on the property’s capability to maintain appropriate amortization and maintenance. In other words, you need to consider “money” or your budget. Personally, I prefer to live in an apartment or condo because of its accompanying low down payment, amenities and benefits and security features. Among the top residential properties in Singapore are Reflections at Keppel Bay, Resort World Sentosa, Highline Residences, and many more. The lifestyle and real estate market trend should be greatly considered when choosing between an apartment and a home. A local real estate agent can help with this information. House or apartment? It all depends on the rental market trends and figures in your local area. The best way to start? Work with a local realtor with good investment acumen. Thanks for giving me some good questions to ask myself while deciding what kind of property I want. I’ve been renting a townhouse, but since my goals are not really long-term investing in an apartment may be a better choice. I’ll be sure to put a lot of thought and research into the investment!